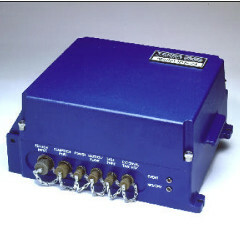 The TSMR-24 is a 24-bit digital data acquisition system. The standard configuration includes a Terra accelerometer providing three channels of acceleration data. The fully configured system may employ additional accelerometers or any of the popular seismometers available to complete an 8 channel seismic monitoring station. Multiple TSMR recorders may be connected in an array to achieve common timing, common triggering, network communications, and data transfer. It is specifically designed for geophysical applications. Each channel employs a forth-order Delta-Sigma digital converter and digital signal processing. With the use of a common clock driving multiple A/D converters, zero channels skew is achieved. TSMR Menu set-up and analysis software may operate under Windows™ and provides a Windows™-like graphical user interface that is easy to use. Analysis software is available, and data is easily converted to ASCII and SUDS format if desired. TSMR recorders are multitasking and provide auto dial and event download, simultaneous recording and communications to a remote PC, and real-time digital data stream output. Time can be synced to UTC via GPS or IRIGE. You can upgrade the system as the application of the instrument changes. The basic system may be field upgraded from 3 to 8 channels, and sensor types may be mixed. The standard 64MB Flash memory is expandable using the second PCMCIA slot or 10 or 20MB memory cards. The unit may be configured, updated, and data downloaded by TC/IP or RS232/922. The corrosion resistant, cast aluminium enclosure provides a stable platform for Terra’s triaxial accelerometer module that may be easily deployed externally by the addition of an MS connector and a cable. The enclosure of both the TSMR and sensor are NEMA 6P rated for prolonged submersion in water.